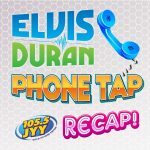 Elvis Duran is the host of the show, the host of the party, the Maitre’d of the mornings! He has lived in New York for almost 20 years and calls it one of the greatest cities in the world. Besides being a daddy to a mini-Schnauzer named Max, Elvis loves traveling, great movies, books, wines, and restaurants. Some of his favorite shows are American Horror Story, Black Mirror, and Celebrity Apprentice.